How to Clean Your Camera Sensor Simplified! On almost every digital photography workshop we have held, one problem our clients seem to stress about is sensor dust cleaning. Many take their cameras to the local camera store if they can find one these days, to have this service done. Or, they end up sending directly to the manufacturer to have the camera sensor cleaning done for an exorbitant price. Pricing to have this service performed in a camera store can range up to $50. Manufacturers may charge much more as they will do an overall general cleaning and adjustment for one price. This can run up to $300 which seems to be the minimum these days with most camera companies. When you only need a few specks or small blobs removed from your camera’s sensor now and then, this seems a bit steep when everything else is working fine! The problem is, many people think that camera sensor cleaning is just too complicated. I’ve been using digital SLR cameras since they came on the market back in the 90’s. These things certainly were a mystery when they first came out. Coming off of film photography since high school, I figured this was something new I had to master. Moving into the digital age of photography wasn’t as difficult as it sounds. In the early days of digital capture, there were so many ways available to clean your camera’s sensor. They ranged from puffer balls that were supposed to simply blow those dust specs away. Then there were the deceptively simple sensor pads to wipe the dust-out. There were also specially designed brushes that created a magnetic/static field to draw the dust into as you swept them across your camera’s sensor. And last but not least, there were complicated and fidgety “One Size Fits All”swabs. You had to wrap these up and around a stick using a special fluid to hopefully do the job. Yes, I’ve tried them all of those camera sensor cleaning products! Using all of these various devices never really did much but move the dirt around or they smeared more muck across my camera’s sensor. During this process, your sensor is never really exposed. There’s a certain theater when it comes to the word “Sensor”. That word brings fear in most people’s minds as the most delicate part of the camera. It was like an open heart exposed to bacteria or something awful. Don’t go near it by any means. Leave it to the surgeons! While it is a delicate part of the camera, many don’t realize your camera’s sensor will need cleaning from time to time. The best part is the thin low pass glass that protects the sensor over multiple cleaning procedures. While most new cameras have a built-in sonic vibration device built in, this will maybe shake some dust off and will only take you so far. Your camera will require a manual cleaning eventually no matter what. That is if you ever plan on changing your lenses. The great part is, if you can change a lens and put in a media card, you can do this. The systems are more robust than you might think. They do look delicate but relax, when you decide you want to clean your sensor yourself, the above video will walk you through it. I’ve boiled things down in this video on how I’ve taken care of my camera sensor cleaning for years now. I have used every method out there and have simplified it. 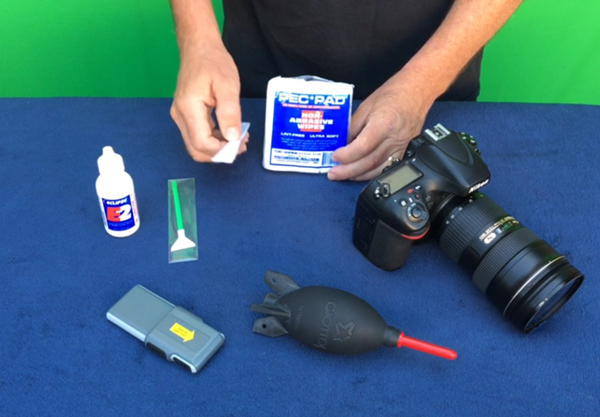 Starting with a safe and basic puffball, or rocket blower, then moving on to a simple and quick wet cleaning system that will clean away 99.9% of your camera sensor’s dirty ills. Using some basics explained in this video and a little common sense will go a long way and save you a few dollars towards a new lens, or maybe a trip to Iceland with Jansen Photo Expeditions. Then I’ll show you first hand how to get your camera sensor really dirty! All the best and have some fun cleaning your camera sensor! Mark’s interest in photography and love for landscape photography draws him into some amazing places and he freely shares this knowledge on his photography workshops. He researches his subjects extensively, making many trips to selected areas waiting for the perfect light, an interesting approach to the subject, and just the right moment. His goal of "freezing time for others to enjoy" is what drives him to create his visions and teach workshops.Mark offers photographic workshops in numerous U.S. and International locations with his business, Jansen Photo Expeditions. He is an expert and personable instructor, expedition leader and award winning, visionary photographer. Mark has over 25 years of professional fine art and photographic experience. He has a passion for landscape and classic aviation photography and provides large scale commercial installations of his fine art photographic murals and print works throughout California. He works with both small and large corporate businesses in helping them project a powerful impact through his images.